About 20 years ago, the former Solitary Vireo was split into three species. 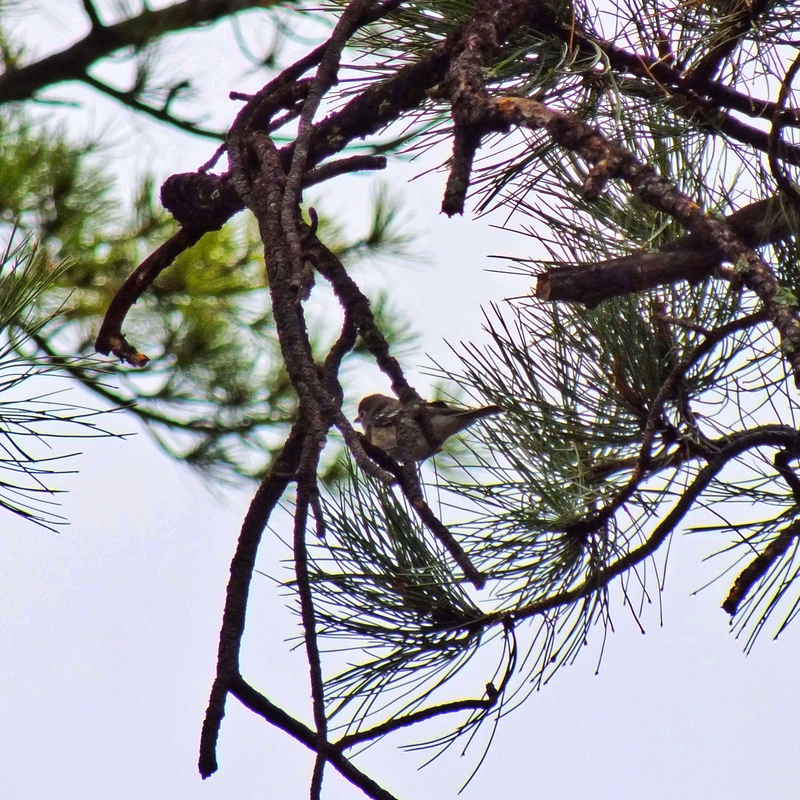 The eastern form, which I’ve seen many times, is called the Blue-headed Vireo. The southwestern form, which nests in Colorado, is now the Plumbeous Vireo. I’ve spotted several of them since we moved out here. The third form, Cassin’s Vireo, nests in the northwest and migrates through Colorado. It’s fairly rare in the spring, but much more common for a couple weeks in the fall. I’ve never seen one. The plummage differences between the three species make things challenging. All have bold white spectacles and obvious wing bars. The Plumbeous is almost all gray, but with a touch of yellowish on the flanks in the fall. Cassin’s has more yellow on the flanks and sides and a wash of green on the back and wings. 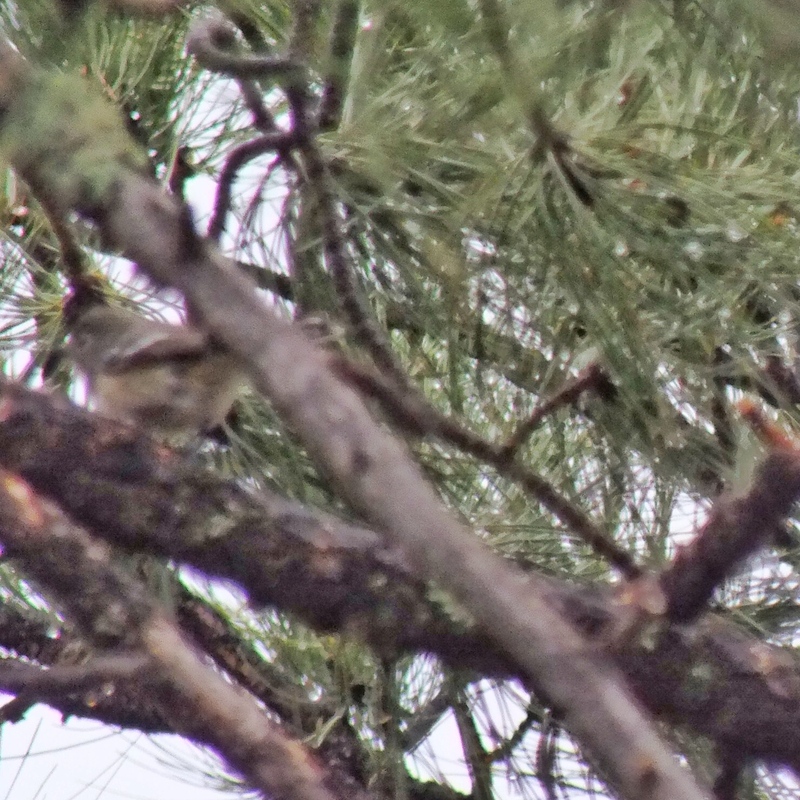 On Sunday evening, I found a “Solitary” vireo along Monument Creek and got excited for a minute. But as I followed the bird through the scrub oak, I saw that it only had a bit of yellow on the flanks and was otherwise gray. I went out again on Labor Day Monday morning, this time to Aiken Canyon Preserve. It was a cool, overcast morning, and I had the place to myself. I hadn’t gone far before it began raining hard. 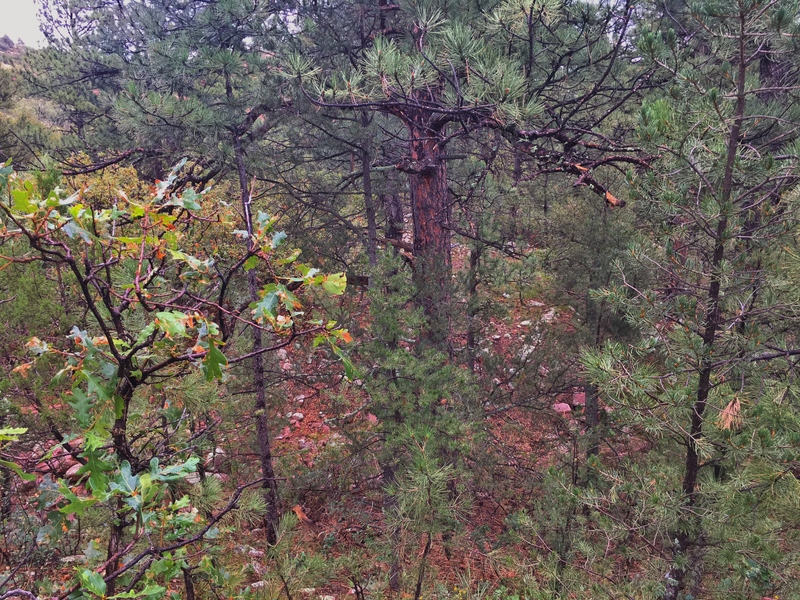 I took what shelter I could find in a clump of scrub oak, but was soon very wet. When the rain stopped 15 minutes later, I decided to continue instead of heading back to the car. 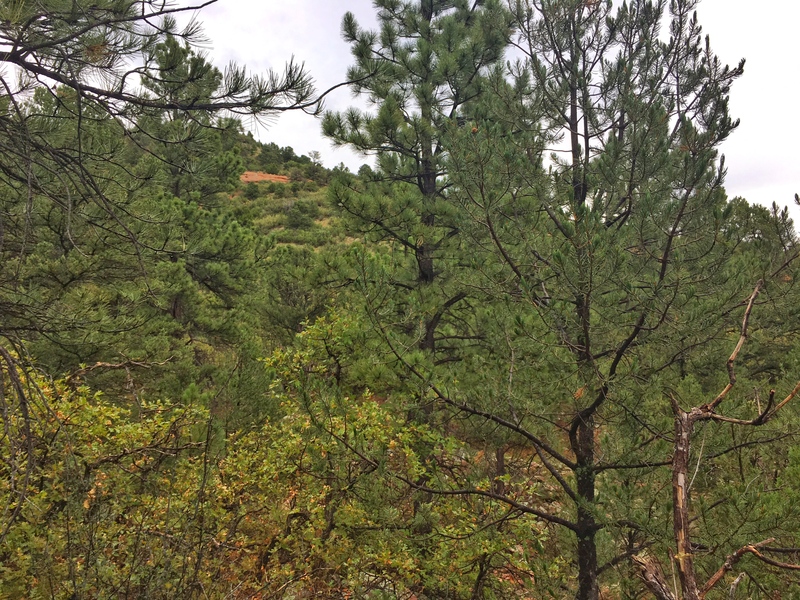 I climbed up into a rocky canyon with ponderosa pines and an understory of scrub oak and came upon a mixed flock of birds. 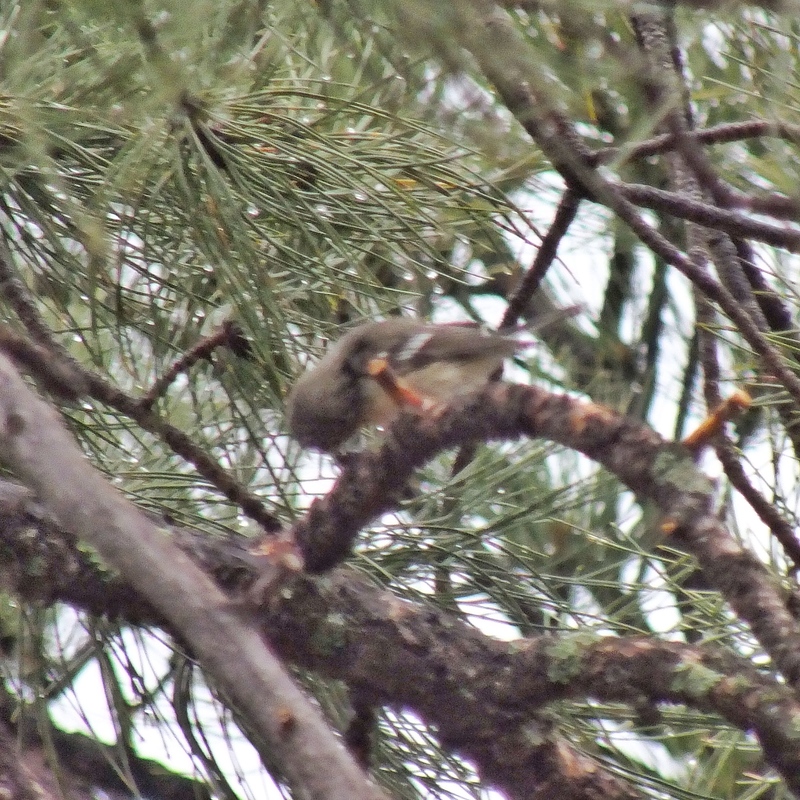 Most of them were Pygmy Nuthatches, but I also saw Mountain Chickadees, a Wilson’s Warbler, a Yellow-rumped Warbler, three Western Wood-Pewees, and a “Solitary” vireo. This one had pale yellow all along its sides and flanks. It’s head was light gray, and its back had a greenish wash.
After getting a good look, I pulled out my camera and attempted to get a photo. 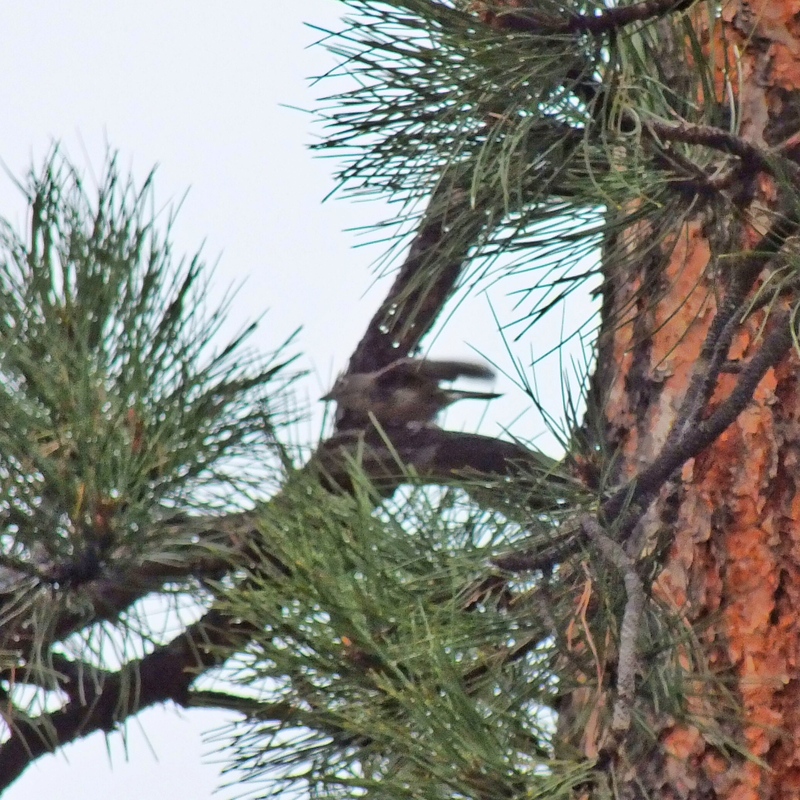 It was moving fairly quickly through the lower branches of a pine. I lost sight of it, but found it again about two minutes later. Again I got good looks at the greenish back that contrasted with the gray head and the yellow sides. It flicked its wings a time or two while I was watching—I think I caught it mid-flick in a couple of the photos. It was still a very gray day, and the bird was back-lit against the sky, so the color doesn’t really come through in the photos, although I can get a hint of the yellow sides. It hopped from the pines into some scrub oak, and I lost it. I hung around for another 10 minutes, but didn’t spot it again. I suppose there were about four minutes from when I first saw it until it disappeared.